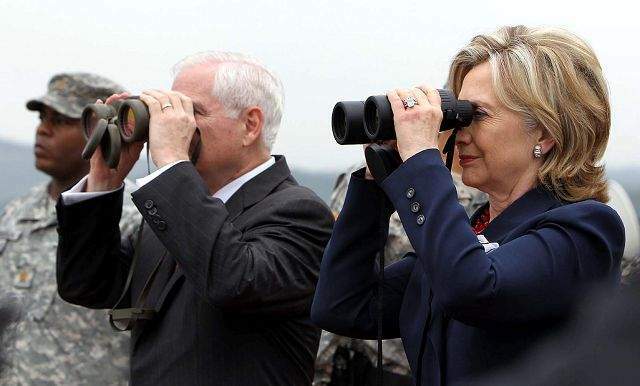 U.S. Secretary of State Hillary Rodham Clinton and Defense Secretary Robert Gates look Wednesday at North Korea from Camp Oulette in the demilitarized zone that separates the two Koreas. SEOUL, South Korea  The Obama administration moved Wednesday to push new sanctions against North Korea over its nuclear weapons program, as Secretary of State Hillary Rodham Clinton and Defense Secretary Robert Gates showed solidarity with South Korea during a visit to the area that separates it from the North. Clinton announced the new measures  targeting the sale or purchase of arms and related goods used to fund the communist regimes nuclear activities, and the acquisition of luxury items to reward its elite  after she and Gates toured the heavily fortified border in a symbolic trip four months after the sinking of a South Korean warship blamed on the North. The penalties are intended to further isolate the already hermetic North and persuade its leaders to return to talks aimed at getting it to abandon atomic weapons. The U.S. also is trying to forestall future provocative acts like the torpedoing of the Cheonan, which killed 46 South Korean sailors. With specifics of the sanctions still being worked out, the more striking demonstration of U.S. resolve came when Clinton and Gates  in a first for Americas top two cabinet members  together toured the demilitarized zone in the village of Panmunjom. Under sporadic downpours and the watchful gaze of curious North Korean guards, they paid tribute to the U.S., South Korean and international forces that patrol the worlds last Cold War-era border. Sixty years after the fighting began, the peninsula remains divided in a state of war because the conflict ended in a truce, not a peace treaty. At one point, in the Military Armistice Commission building where officials from North Korea and the U.N. Command meet for talks, Clinton and Gates stood briefly on North Korean soil while a North Korean solider peered at them through a window. In fact, our military alliance has never been stronger and should deter any potential aggressor, he said. In response to the Cheonan sinking, the U.S. and South Korea have announced plans to conduct new military exercises in the coming weeks, sparking threats from North Korea and expressions of concern from its lone major ally, China. Both Gates and Clinton said that since the Korean War, the South has become a major economic power while the North has stagnated under international isolation. Although it may be a thin line, these two places are worlds apart, Clinton said, referring to the three-mile-deep buffer zone that stretches from east to west and lies just 30 miles from the South Korean capital. She urged North Korea to turn away from the isolation that has left its people suffering. Clinton repeated that message later after security talks with Gates and their South Korean counterparts. Presenting the outlines of the fresh sanctions, Clinton said the North could win the security and international respect it seeks by stopping its provocative behavior, halting threats toward its neighbors and returning to denuclearization talks. Details of the sanctions are being completed, but Clinton and other U.S. officials said they would enhance and expand on existing international financial and travel sanctions. The U.S. will freeze additional assets, prevent more individuals from traveling abroad and collaborate with banks to stop suspect transactions, they said. The U.S. also will seek to stop North Koreas abuse of diplomatic privileges to carry out illegal activities, notably cigarette and currency counterfeiting and money laundering, they said. The council earlier this month approved a statement condemning the Cheonan incident, but did not directly blame Pyongyang. Still, the U.S. and South Korea are adamant that North Korea apologize for the incident or face punishment, and warned against further provocations. An international team of investigators pinned the explosion of the Cheonan on a torpedo fired from a North Korean submarine. But North Korea denies any involvement and has threatened war if punished for it.